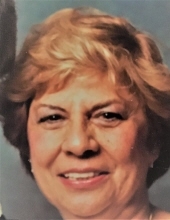 Marjorie Arvanigian passed away with her family around her on January 17, 2019 in Livonia, Michigan. Born in Detroit on July 12, 1927, she was the daughter of Parsegh and Arousiag (nee Keteian) Topelian She grew up in the warm Armenian community of Delray, helping her parents in the family grocery store. She attended the Armenian School in the Zavarian Club, across the street from the store. Successfully completing her education, Marjorie graduated from Southwestern High School. She met Edward Arvanigian during an AYF Convention and they got married November, 1951. Living briefly in Worchester, MA, the happy couple moved to Detroit, where her husband began working for Ford Motor Company. Establishing their home in Allen Park, they were blessed with the birth of their daughters, Kari and Linda. Marjorie was an excellent housekeeper, teaching her daughters by her own good example. As members of St. Sarkis Armenian Apostolic Church, and the AYF, she and Ed were supporters of the greater Armenian community. Sunday dinners with grandparents were special occasions for the family. Marjorie also loved to entertain and hosted their many friends. She was a quiet person, but was spunky and spoke up when needed. She and Ed enjoyed traveling together, especially to the casino in Las Vegas. Most importantly, with pride of home and family, Marjorie leaves them a legacy of love, especially for her grandsons, “Her Boys”. In State January 19, 2019, Saturday from 10am until time of funeral service at 11:00am in St. Sarkis Armenian Apostolic Church, 19300 Ford Road, (W of Southfield Fwy) Dearborn 48128. The family suggests memorials be sent to St Sarkis Armenian Apostolic Church. Pleas click on "Share a Memory" and leave a loving remembrance/condolence here. To send flowers or a remembrance gift to the family of MARJORIE ARVANIGIAN, please visit our Tribute Store. "Email Address" would like to share the life celebration of MARJORIE ARVANIGIAN. Click on the "link" to go to share a favorite memory or leave a condolence message for the family.